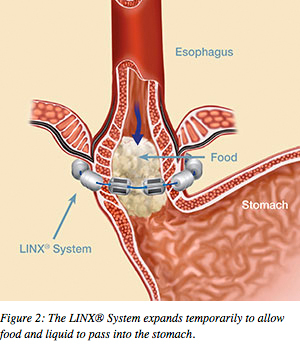 The LINX® System is a small, flexible band of magnets enclosed in titanium beads. The beads are connected by titanium wires. 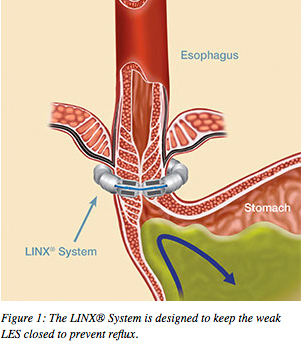 The magnetic attraction between the beads helps keep the weak LES closed to prevent reflux (see Figure 1). Swallowing forces temporarily break the magnetic bond, allowing food and liquid to pass into the stomach (see Figure 2). Magnetic attraction closes the LES after swallowing, to reinforce the body’s natural barrier to reflux.